Cloud visibility is important for organizations as reducing cost is their main agenda. Organizations require a cloud management solution to monitor, diagnose and notify about all the issues in their cloud infrastructure. That said, analyzing your AWS Redshift cost by family become essential when it comes to cost clarity. Why you should keep track of your Redshift resources and costs they incur? Amazon Redshift is a fully managed data warehouse service of petabyte-scale developed to handle the analytical workloads. Redshift has various product families which categorize the type of Redshift resources provided by Amazon Web Services. Any Redshift line item could show up on your AWS bill which can make difficult for users to understand the reason for that cost. To get an in-depth understanding of Amazon Redshift, read this insider piece. Centilytics provides AWS users an insight for analyzing their Redshift Cost by family. 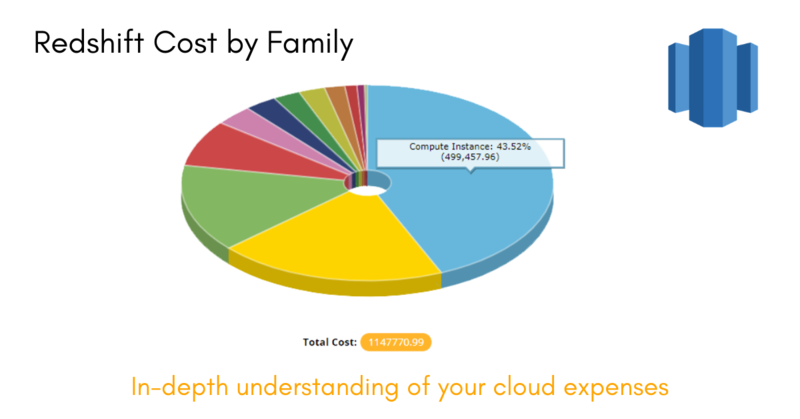 This insight shows all the Redshift resources under their respective families running in your cloud infrastructure and the cost incurred by them. Users can therefore easily interpret their cost using our tabular representation or graphical (pie-chart) representation or both. Product Family: This column displays the Redshift product family. Product family shows the cost distribution of your total cost spent on Redshift related resources. It can be sorted in ascending and descending order according to the cost with just a single click. Cost: This column displays the cost (in dollars) corresponding to the product family. Cost can be sorted in ascending and descending order. Resource Tags Applying resource tags filter will display data which will have the selected resource tag. For e.g., If the user has tagged any resource using a tag named environment, then selecting an environment from the resource tags filter will display all the data accordingly. Resource Tags Value Applying resource tags value filter will display data which will have the selected resource tag value. For e.g.- If the user has tagged some resource by a tag named environment and has given it a value say production (environment: production), then the user will be able to view data of all the resources which are tagged as “environment:production”. The user can use the tag value filter only when a tag name has been provided. Currency Selecting this filter will allow users to convert their corresponding cost from one currency to another. By default, your cost is shown in USD (US Dollars). Using this filter, your cost in USD will get converted into the equivalent cost of the selected currency. For e.g., selecting INR from currency filter will convert your US dollar cost to Indian rupee cost. Previous articleWhy is it important to analyze AWS RDS cost by family?